Patents « Steven J. Crowley, P.E. Techdirt prefers the following view of mobile patent lawsuits over one prepared by Information is Beautiful a few weeks earlier. Take these graphics with a grain of salt; both versions, for example, show Nokia versus Qualcomm, but those two have settled (for now). In its version, Techdirt adds entities that aren’t vendors, such as patent holding firms (in the hexagons). Other entities get pulled in, too. Show up at an industry standards-setting meeting in which a plaintiff or defendant is participating, and you might get a subpoena, just for good measure. Patent pools are sometimes used for efficiency, including that gained from reduced litigation. Techdirt makes an argument against them saying they restrict innovation. 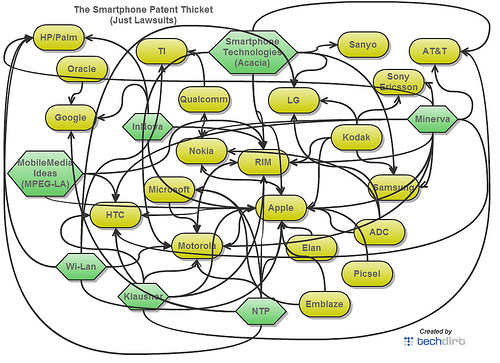 It prefers to let the market decide, presumably by having patent holders negotiate with each other. It has a point, but that is what wireless companies did before patent pools, and the pools’ formation were themselves a market response to that hassle. I don’t think the IEEE 802.11 patent pool has hindered the remarkable innovation still ongoing in that family of technologies. To the extent it has, I think it would be offset by patent pool efficiencies, such as moving things along more quickly. If companies don’t like a pool, they can and do choose to not join and instead negotiate separately. Qualcomm and some other companies, for example, chose to sit out the patent pool for 3G W-CDMA, even though they held essential patents. Larry Downes explores several drivers of mobile patent lawsuits, and suggests a mobile-device patent pool as one solution. Moreover, he says, mobile device winners will be those companies focusing on compelling consumer offerings, instead of patent disputes. Sisvel announces it is working with 20 companies to try to form a patent pool for 3GPP Long Term Evolution (LTE) and System Architecture Evolution (SAE). It invites other companies to participate. Urgent Communications has a take on this from a public safety perspective, and notes MPEG LA and Via Licensing are also trying to form patent pools. VIA Licensing may soon announce the status of its progress. Location-based services are reaching beyond navigation and E911. Social networking, advertising, and other emerging applications are driving research and development into better technologies in support of these services, starting with the location estimation process itself. Today, there are several ways to determine the location of a wireless device in a network. As a rough estimate, the device knows the identification of the base station or access point with which it is associated. That’s a start, but a base station can cover a wide area. To refine that, devices can use GPS. Networks of cellular base stations can measure differences in the timing or signal strength of an uplink signal, and use the results to estimate location. MAC addresses of Wi-Fi access points can be sniffed and mapped by roving monitors. Sometimes, two or more of these techniques are used in concert.